There are few cities in the mountains. A centuries old observation. Slowed by the geographic limitations and dependent on political considerations, the growth of Alpine cities has always trailed that of other cities. A historian takes a look at the specific aspects of this phenomenon. 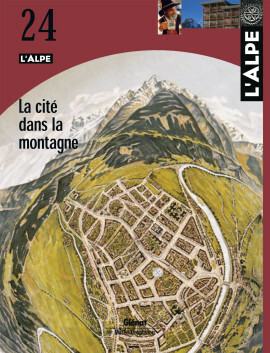 Just what is an Alpine city ? The question is more complex than it would appear and raises two other, equally fundamental questions, i.e. what is a city and what are the Alps ? A geographer provides some answers. A gadget or a true positive factor ? The « Alpine character » today flaunted by so many cities is much more than just image. The highly political display of this character would seem to generate innovative new ties. After centuries of opposition, the Alps and urban areas are today forming a new type of territory. Are cities a civilising weapon ? For the Romans, the triumph of order over chaos required well thought out urbanisation and the transformation of the wild mountain folk into peaceable citizens. The impressive Aoste of Roman times, the mythical colony, symbolised imperial power in the heart of the mountains and for centuries played a role as Rome’s equal. Women and gambling, good food and drink…such were the distractions that soldiers in the 1700s found only in Grenoble, a city of many a shady tavern. Far from the boredom of the border forts, the capital city of the Dauphiné offered visiting troops all the pleasures of a large city. From Bavaria to the Tyrol, the cities are many but do not resemble each other. On the one hand, a low-lands metropolis that has erased any mountain identity, on the other, « truly » Alpine cities that have prospered in their valleys, but whose autonomy is threatened by rampant urbanisation. The Olympic Games will change nothing. For centuries, the relations between the capital of the Piemonte and the mountain regions have been difficult to say the least. A metropolitan area with over one million inhabitants located so close to the Alps cannot help but act in a predatory manner. Are the mountains an urban creation ? To tame them, urban dwellers made them part of their garden, before modifying the Alps to better resemble their own image. The many steps of an appropriation. Cities above the snow line, ski resorts created a new manner to live in the mountains. They initially constituted an innovative form of high-altitude urbanism, but have since foundered in a vague neo-rural style. This is a plea for a return to creative architecture. A glass Alp as a plan for a better world ? The enchanting influence of mountains on painters has long been known. But in the beginning of the 1900s, an architect also drew inspiration from them for a grand urban plan that he dedicated to all of humanity in view of finally building a « good home ». In Grenoble, just a skip and a jump from the train station, the last store of Alpine souvenirs just closed for good. In the very heart of the city, Swiss cuckoo clocks and other various artefacts incorporated an idealised image of the mountains that visitors could take home. For a number of years, she has take family photographs that do not resemble anything in our family albums. Tenants in low-income housing and Savoyard peasants mingle here with a blithe indifference that demonstrates more than anything else the banalisation of rural and urban lifestyles. The photographs by Frédéric Lecloux show a city that Western tourists apparently never see. To the point that we must wonder if the mountaineers, in their endlessly repeated travel stories in the mountain magazines, are talking about the same city. Light-years from cheap exoticism, the work is remarkable. In the Alps much more than in the plains, the manual trades were always essential to survival and the development of village communities. To the point that these specific skills were called upon far and wide, well beyond the mountain valleys. Today, however, the flight to the cities has completely disrupted this economic sector.